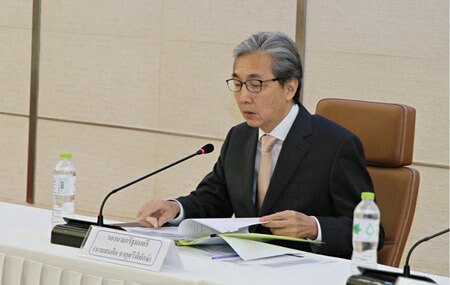 BANGKOK, 25 September 2015 -Deputy Prime Minister Somkid Jatusripitak said the implementation of the government’s mega projects would begin within 5 years’ time. The Deputy Prime Minister said a recent public-private partnership (PPP) meeting has given the green light to five mega projects worth 200 billion baht in total. They include the constructions of three BTS sky train routes and two renewable energy power plants. Private companies that have invested in the government’s projects under the PPP agreement will be required to increase their investment capital from 1 billion to 5 billion baht following the cabinet’s decision. The Deputy Prime Minister said the increase has long been a common practice aimed at reducing the government spending and increasing investment flexibility.